To date, work and organisational psychology research provided strong empirical evidence that mentally healthy employees are more productive than those who are not [1, 2]. Accordingly, scholars started investigating how to promote individual well-being at work based on validated theoretical frameworks, focusing in particular on the prevention and/or the treatment of disease, rather than promoting and improving employee well-being . Indeed, the latter constitutes a paradigm shift representing the foundation of positive organisational behaviour, which builds upon the notion that “positively oriented human resource strengths and psychological capacities can be measured, developed, and effectively managed for performance improvement in today’s workplace” . Such a positive approach to organisational behaviour  underpins the importance of interventions aimed at enhancing individual well-being at work no longer restricted to particularly vulnerable organisational members, but including the entire workforce instead . Positive psychology interventions have been defined as treatment methods or intentional activities that aim to cultivate positive feelings, behaviours or cognitions, with proven positive effects on well-being . Research in this field has mainly focused on interventions undertaking to enhance personal resources and/or promote a cognitive reappraisal of the situation . However, to the best of our knowledge, we are unaware of studies investigating how such interventions may affect individual proactive behaviour directed towards crafting one’s own work experience, which implies nurturing the self-initiated changes that employees make in designing their own job, i.e. job crafting [7, 8]. Specifically, job crafting refers to the proactive changes employees make in their work to increase their job resources and/or challenges and to reduce their hindering job demands . Crafting job resources could take the form of increasing structural (e.g. trying to learn new things) or social (e.g. asking for performance feedback) resources. Increasing challenging demands consists of seeking new and challenging tasks at work (e.g. voluntary taking on new responsibilities or extra tasks) , which sustain motivation, mastering and learning . Decreasing hindering job demands (e.g. making sure that one’s job is mentally less demanding)  refers to a health-protecting coping mechanism adopted to reduce demands perceived as excessively high. The strategies of seeking resources and challenges are defined as expansion job crafting behaviours in that they aim at making the work environment more resourceful and challenging. As a result, such behaviours are likely to reflect in higher work engagement because job resources are key determinants of it [12, 13]. Previous research supports this argument, showing that employees who change their work environment proactively by expanding its resourceful aspects report to be more engaged in their work . Moreover, research has shown that employees who are engaged at work are more likely to be involved in proactive behaviours to tailor their job because they value chances and possibilities in taking initiative [15, 16]. Accordingly, it is likely that training employees on how to proactively shape the resources and the demands of the work environment will have a positive effect on work engagement and that higher work engagement will, in turn, lead to higher job crafting behaviours. Even though research has documented that individual positive psychology interventions improve positive emotions and self-efficacy , which in turn can result in higher levels of work engagement , no studies investigated whether job crafting has a role to play within such a gain cycle. In the light of recent evidence showing that individuals who craft their job can proactively optimize their person-job fit and experience their work as more meaningful , and given that positive outcomes of job crafting behaviours relate to workers’ well-being , including such a stream of literature within that of positive psychology interventions appears of great value. Against this background, this contribution examines how a positive psychology intervention influences job crafting, positive emotions and work engagement in a sample of employees operating in the public-sector. To achieve this aim, we conducted a 3-day resource-based intervention aimed to improve personal cognitive resources by means of practical exercises referred to the organisational context, as described in depth below. The contribution is organized as follows: first, an overview of the literature on positive psychology interventions is presented. Second, job crafting, positive emotions and work engagement are introduced along with evidence from research on their reciprocal relationships and on how such constructs are influenced by positive psychology interventions. Finally, the focus goes to the content of the intervention, illustrating how each of its components is expected to influence the constructs under analysis. Seligman and Csikszentmihalyi  defined positive psychology as the discipline that aims to value subjective experiences at both the individual and the group level. As argued by the authors, such stream of literature includes the study of positive individual traits such as the capacity for love, interpersonal skills, high talent, perseverance, as well as civic virtues moving individuals toward better citizenship – among which responsibility, tolerance and work ethic. As regards the work environment, it is key to understand how to ensure that such a framework is pragmatically transferred to the everyday organisational context. That is, positive psychology interventions constitute a particular approach implemented in the form of training, coaching sessions or other, based on nurturing positive subjective experiences as well as building positive individual traits or civic virtues . This means adopting intervention methods capable of fostering active recalling of cherished moments (i.e. nurturing positive subjective experiences), working on the identification and development of individual strengths (i.e. building positive, individual traits), as well as on positive, desirable characteristics of organizations in general (i.e. building civic virtues) . In a meta-analysis, Sin and Lyubomirsky  reported that over fifty positive psychology interventions have involved working on positive writing, mindfulness and gratitude, which can all be referred to interventions aiming at nurturing positive subjective experiences. Such interventions build on Fredrickon’s broaden and build theory , claiming that positive emotions are worth cultivating so as to broaden one’s mind frame and trigger off actions that contribute to build important personal, i.e., social, physiological, and cognitive resources. That is, generating positive emotions can favour upward spirals, whereby personal resources lead to positive emotions that produce more positive personal resources, and so forth. In a positive psychology intervention case, for instance, such process would be fostered by letting participants write down things they feel grateful for on a daily or weekly basis (i.e. gratitude interventions) . Another set of positive psychology intervention aims at building positive individual traits focusing on personal strengths. This process is facilitated by letting participants think about times when they performed at their best or about the nature of their strengths, as well as on different ways of using one’s well-known positive aspects . Moreover, a related approach involves analysing oneself from different angles - the so-called “reflected best self” exercise, in which people in the context provide examples of times when they performed best . Besides, another method focusing on strength development is solution-focused coaching , which includes goal setting, a technique useful in developing hope while motivating people by boosting their self-efficacy [26, 27]. Overall, research in this field showed that focusing on one’s strengths brings about feelings of fulfilment and engagement , resulting in higher individual well-being, which in turn is likely to be associated to higher performance . As for interventions focussing on transferring valued organisational characteristics, i.e. building civic virtues, one key method consists in identifying life-giving forces and core strengths within the organisation and using them to create personalised goals. Such an appreciative inquiry approach zooms in on stories of organisational successes, highlighting the development of ideas to be shared about a positive future and setting up action-plans to reach the ideally designed organisation . That is, it actively bypasses destructive processes such as negation, mutual criticism and spiralling problem diagnosis to create high motivation and feelings of cooperation among organisational members as well as fostering a productive and appreciative atmosphere in the workplace . Overall, as reported by Meyers and colleagues , findings from studies on positive psychology interventions carried out in work contexts show that they enhance employee well-being. That is, employees experiencing highly positive feelings are less inclined to leave the company . Moreover, research shows that they tend to be more creative  and are facilitated in building cognitive, physical, and social resources [33, 34]. Besides, previous studies showed that the positive outcomes of such interventions include improved physical health , tracing progress in workers affected by depression and illness , as well as reducing the risk of depression at the same time . Even though such findings are important to further knowledge on the effects and the characteristics for positive psychology interventions to be effective, there is still much work to be done to test whether such interventions can influence the development of positive affective states and positive work and organisational-related constructs, i.e. job crafting and work engagement. In order to be considered as a positive psychological intervention, an intervention’s goal must necessarily target well-being. Typically, well-being in intervention studies is defined and measured by means of purely subjective approaches. That is, it is viewed as the overall positive evaluation of one’s life which, rather than being considered purely as a cognitive experience, involves frequent occurrences of positive emotions versus few experiences bearing negative emotions . Successfully completed intervention studies use diverse outcomes to highlight the range of nuances connected to well-being, including raised feelings of happiness, life satisfaction and other positive emotions, while minimizing depressive symptoms and detrimental emotions, an aspect that has been highlighted in the existing meta-analyses on interventions within positive psychology [37, 5]. To date, affective well-being has been considered as central to mental health and human experience [38, 39]. Theoretical models have been developed in order to explain well-being associating it with degrees of pleasantness and arousal . Specifically, they conceptualize emotions into a two-dimension framework including an antithetical theorization of positive/negative affects and viewing them as complementary with multifactorial structures . Since then, models of affective well-being have been conceptualised to be specific to the work context [41, 42]. Such models introduced work-related emotions classifying them according to the pleasantness and arousal criteria, by means of a specific scale measuring work-related emotions. A significant distinction should be made between work-related positive emotions and a positive work-related experience, such as work engagement. Whereas the former can be defined as intense, transitory episodes related to specific work-related situations , work engagement is characterized by a more long-term attitude . In this sense, positive emotions can be seen as the threshold leading to work engagement, actively influencing the onset of the more enduring feeling as they prompt individuals to set themselves objectives and work in a target-oriented way [45, 46]. This is in line with Broaden-and-Build (B&B) theory  stating that positive emotions produce future well-being since they promote exploratory behaviours linked to learning opportunities that lead to achieving goals while building long-lasting inner resources. Accordingly, work engagement can be viewed as one potential outcome of an enduring state of well-being. Even though evidence from research shows that positive affect generates not only a flexibly broad cognitive set-up but also enhances the integration of diverse cognitive elements [47, 48] there is a need for more in-depth analysis on how and whether such broadened perspectives transfer to decision-making and actions taken in the workplace specifically . Previous findings reported evidence of significant correlations between positive emotions and resources, and work engagement and productivity . Moreover, research found evidence of a motivational gain cycle explaining the bidirectional flow between the two domains , including predictability of work engagement based on positive emotions and personal resources. Such research integrated B&B theory into the motivational process of the job demands-resources model  resulting in a combined model that acknowledges positive emotion coupled with the potential of personal resources as the building blocks that enable to foresee levels of work engagement. Lately, the concept has been further developed, introducing the idea of a gain cycle in which all interrelated elements involved – namely positive emotions, personal resources and work engagement – act together without a specific causal sequence. These findings imply that positive emotions, as initiators of the building process, only indirectly predict work engagement via strengthening of personal resources. It follows that by intervening on positive emotions the level of work engagement may be significantly enhanced. The key to survival of organisations nowadays lies in their level of flexibility shown in continually adapting to a generally uncertain environment, both from an economic and technological point of view, while facing the competitive strain . The issue is not only relevant on the large-scale, i.e. in terms of organisations as such, but involves rethinking employee job design, defined as the way jobs, tasks and roles are structured, enacted and modified, and as the impact of these structures, enactments and modifications on individual, group and organisation outcomes . The key expression here is job crafting, meant as a proactive participation in the job redesign process, whereby workers mould their jobs to meet their own needs and preferences  and by doing this they create meaningful experiences for themselves. At the company level, the beneficial outcome is the fostering of innovativeness and adaptability  while ensuring that employees gain the necessary skills to cope with the challenges brought about by uncertainty and change . Specifically, job crafting is defined by Wrzesniewski & Dutton  as the physical and cognitive changes individuals operate at task or relational level. It has to do with how the job is perceived from a cognitive point of view, where its boundaries are set and how the intrinsic relationships between different job tasks are perceived to have an impact on the interactions with other workers. Job crafting can hence be defined as a psychological, social and physical act, resulting in a change of identity of the job crafter who finds a new meaning in work-related tasks, leading to a “customized”, newly flourished job. Interestingly enough, job crafting is reported to promote more positive than negative emotions  and is therefore naturally connected to the concept of well-being [56-62], to the point that it turns out to be one of the pivotal factors to predict workplace well-being . Hypothesis 1: Job crafting predicts positive emotions, which in turn are positively related to work engagement. Hypothesis 2: The level of employees’ work engagement after the FAMILY positive psychology intervention is significantly higher when compared to the level assessed before the intervention. Hypothesis 3: Work engagement before the intervention (T1) will be positively related to job crafting after the intervention (T2). 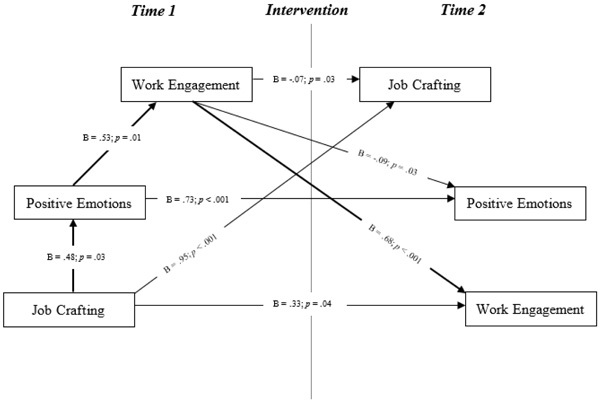 Hypothesis 4: The relationship between job crafting, positive emotions and work engagement before the intervention (T1) will be strengthened following the intervention (T2). Participants were 43 office workers in an organisation of the public administration in Northern Italy. This research consists of a semi-experimental study with pre-test, intervention and post-test. We used a simple random sampling method to select the potential participants, who were invited to take part to an intervention aiming at supporting well-being at work. Once that participants were informed about the focus of the intervention, participation was voluntary. Participants completed a survey prior to the intervention (T1, pre-measure) and 2 weeks after the intervention (T2, post-measure). The intervention was conducted in two groups of 20 and 23 participants respectively to facilitate active participation. Participants received three day-long training sessions of the resource-based intervention program, i.e. FAMILY intervention  and data in the pre-test and post-test stages were collected using Job-Related Affective Well-being (JAWS), job crafting, and work engagement scales. Following the protocol described in Costantini and colleagues , the intervention focused on a number of positive reappraisals of the work role. It consisted of six steps as follows: (1) Framing, which refers to the framing concept, or helping individuals to focus on the positive rather than on the negative aspects of work. Re-framing is also a cognitive process that can transform limiting beliefs and reframe negative experiences by changing the meanings attributed to them and allowing participants to learn from their experience in order to take advantage for the purposes of their daily work by adopting a new way of looking at things; (2) Attitudes, which refer to the appropriate attitudes that participants should be taught, to develop and reach the desired level of engagement, well-being and performance. In this phase, employees are trained to look at each situation from a positive perspective, i.e. perceiving situations as opportunities for gaining and growth rather than perceiving situations in a threatening way; (3) Meaningfulness, which refers to psychological meaningfulness at work. In this step, the idea is to enhance a sense of meaning and purpose in one’s personal life, connecting it to the organisational mission. Specifically, researchers focused on making participants reflecting on the connection between personal values and the organisational mission in order to find the linkages between these two elements and to make them jointly develop; (4) Identity, which aims to restore a sense of identity and affiliation with respect to the organisation. In this step, the coach delves deeper into the personal domain, enquiring about individual aspirations within the organisational context. (5) Leading self, which focuses on the development of self-awareness, emotional maturity and greater effectiveness; and (6) Yoked together, aiming to build a feeling of connection both with colleagues (at team level) and with the organisation (at a broader level). In order to test our hypotheses, surveys were administered to 43 Italian workers employed in the public administration. Of those who were involved in the intervention and completed the surveys, 60.2% were females and 39.8% males, with an average age of 50.45 years (SD = 7.71). The research staff provided participants with the questionnaire and explained the anonymous nature of the data collection, as well as the purposes of the study, i.e., understanding the nature of well-being at work and how to promote it. Anonymity (pre- and post-test) was guaranteed by the insertion of an identification code that each respondent had to include in the initial part of the questionnaire. This identification code was formed by the initial letters (three) of significant persons and objects of the respondent’s life that together constitute a code of nine letters in a recognisable position to match the pre- and post- respondents’ questionnaires. Question order was counterbalanced to avoid common method bias . Job crafting (α at Time 1 = .70; α at Time 2 = .70). The 21-item Job Crafting Scale  was used to assess job crafting behaviours. Example items are “I try to learn new things at work”, “I ask others for feedback on my job performance”, “When an interesting project comes along, I offer myself proactively as project co-worker”, and “I make sure that my work is mentally less intense”. Items were rated on a 5-point scale, ranging from 1 (‘never’) to 5 (‘very often’). Job-Related Affective States. The 12-item Job-related Affective Well-being Scale (JAWS)  was used to measure positive and negative job-related emotions experienced during the previous month (30 days). This version of the JAWS assesses both positive (6 items, e.g. “full of energy”; α at Time 1 = .84; at Time 2 = .78) as well as-negative emotions (6 items, e.g. “angry”; α at Time 1 = .80; at Time 2 = .78). Every item was scored on a 5-point scale, ranging from 1 – never to 5 – extremely often. Work engagement (α at Time 1=.90 and at Time 2=.89). Work engagement was assessed with the Italian version of the 9-item Utrecht Work Engagement Scale developed by Schaufeli and colleagues . This scale includes six items for the vigour component (e.g. “At work, I feel bursting with energy”), six items for the absorption component (e.g. “I am immersed in my work”), and five items for the dedication component (e.g. “I am enthusiastic about my job”). Responses were scored on a 7-point Likert scale ranging from 0 - never to 6 - always. Based on results from Schaufeli, Bakker, and Salanova  showing that the three dimensions are closely related, we used one overall index for work engagement. To test our hypotheses, we used bootstrap estimation approach with 1000 samples  and paired sample t-tests (results are featured in Table 2) to investigate the effects of the intervention, which tested the significance of the difference between the self-reported measures at Time 1 (T1) and at Time 2 (T2). Furthermore, to test whether a reciprocal relationship from job crafting to work engagement through positive emotions exists, hypothesized as being strengthened through positive intervention, we used bootstrapping following the PROCESS procedure recommended by Hayes (2013), involving the use of Model 6 with 4 mediators. We inserted job crafting at T1 as an independent variable (X), positive emotions at T1 as first Mediator (M1), work engagement at T1 as second Mediator (M2), job crafting at T2 as third Mediator (M3), positive emotions at T2 as fourth Mediator (M4), and work engagement at T2 as the final dependent variable (Y). Table 1 details descriptive statistics referred to the constructs and correlations between the variables considered. At Time 1, work engagement was significantly positively correlated with positive emotions (r = .59, p < .01) and job crafting (r = .28, p < .01). Positive emotions were significantly negatively correlated with negative emotions (r = -.23, p < .05), and job crafting was significantly positively correlated with positive emotions (r = .35, p < .01). At Time 2, work engagement and job crafting were significantly positively correlated with positive emotions (respectively, r = .37, p < .01; r = .34, p < .05). Table 1. Means, Standard Deviations (SD), and Correlations between the Study Variables at Time 1 and Time 2. Note. N = 43. Correlations below the diagonal, Time 1. Correlations above the diagonal, Time 2. * p < .05; ** p < .01 (2-tails). As Table 2 shows, results from the paired sample t-test showed that the levels of all the constructs assessed prior to and after the intervention show to be significantly higher at Time 2 compared to Time 1. That is, work engagement, positive emotions and job crafting showed significant improvements following the intervention. As it can be seen, a significant mean difference on all variables was found between Time 1 and Time 2, respectively for work engagement t(54) = 10.93, p < .001; for positive emotions t(54) = 9.64, p < .001; and for job crafting t(54) = 10.51, p < .001. Namely, the most noticeable change occurred with work engagement, having the largest mean difference among the constructs considered (.596), while positive emotions reported the largest effect size (-2.23). These results confirmed Hypothesis 2 that work engagement after the intervention would have been significantly higher compared to prior the intervention. Table 2. Paired sample t-test results for Work Engagement, Positive Emotions, and Job Crafting at Time 1 and 2. Note. N = 43. T1 = Time 1. T2 = Time 2. Results from bootstrapping revealed that at T1 job crafting was significantly related to positive emotions (B = .48, p = .03), which in turn were significantly related to work engagement (B = .53, p = .01). Work engagement at T1 was in turn significantly related to job crafting at T2 (B = -.07, p = .03). No significant relationships were found between job crafting at T2, positive emotions, and work engagement at T2. The direct effect of job crafting at T1 on work engagement at T2 was significant (B = .33, p = .04). Job crafting at T1 was significantly related to job crafting at T2 (B = .95, p < .001), and work engagement at T1 was significantly related to positive emotions at T2 (B = -.09, p = .03). Positive emotions at T1 were positively related to positive emotions at T2 (B = .73, p < .001). An analysis of the significant indirect effects within the whole model revealed that there was a significant indirect effect of job crafting at T1 on work engagement at T2 through positive emotions and work engagement at T1 (B = .17; 95%CI [.018, .504]). None of the other indirect effects allowed for in the model were significant. Fig. (1) shows a graphical representation of the significant relationships found. Fig. (1). Graphical representation of the significant relationships found. The purpose of this study was twofold: First, we intended to test the effects of the proposed intervention on work engagement and well-being at work; Second, we investigated whether job crafting can be considered as an antecedent of a recursive relationship between positive emotions and work engagement. Measures of each of these variables, i.e., positive emotions, job crafting and work engagement, were taken before and after the intervention to investigate the hypothesized relationships and how they changed after the intervention. Hypothesis 1 stated that job crafting predicts positive emotions, which in turn are positively related to work engagement. The results from our data supported this Hypothesis. Findings suggest that those who proactively initiate changes in their work environment and over their work-related tasks are likely to experience work-related positive emotions. Such a positive experience relates to work engagement, meaning that those who craft their job are also likely to experience a positive, fulfilling, work-related state of mind, through positive emotions. Hypothesis 2 argued that the level of employees’ work engagement after the intervention is significantly higher compared to the levels of work engagement assessed prior the intervention. Our results also supported this Hypothesis, providing evidence of the effectiveness of the FAMILY positive psychology intervention to enhance and foster not only work engagement, but also positive emotions and job crafting behaviours among employees. Hypothesis 3 stated that the levels of work engagement before the intervention would have been positively associated with job crafting assessed after the intervention. This Hypothesis was not supported in that work engagement before the intervention resulted to be negatively related to job crafting afterward. These counterintuitive findings are interesting and may suggest that those who reported higher levels of work engagement and took part to the intervention didn’t feel in need for crafting their job because already positively engaged and experiencing positive, work-related state of mind. Hypothesis 4 stated that the relationship between job crafting, positive emotions and work engagement before the intervention will be strengthened afterwards. This fourth Hypothesis is partially supported in that findings show that there is not a direct effect between the recursive relationships before and after the intervention. The only significant indirect effect found was the one linking job crafting, positive emotions and work engagement at Time 1, and work engagement at Time 2 (see the bold line in Fig. 1). These results may be linked to the content of the intervention, which was focused on improving personal cognitive resources rather than on improving individual strategies to craft one’s job. This may reflect in higher absorption and dedication toward the work and the organisation, eventually resulting in the enhancement of work engagement rather than in higher self-management processes between job demands and resources. Overall, these results provide evidence of the role of job crafting as an activator of the positive cycle between positive emotions and work engagement, which is sustained after the FAMILY positive psychology intervention focused on positive reappraisals of the work role. Besides, results from the t-test provide support for the effectiveness of the intervention to enhance employees’ work engagement. Our study contributes to research on positive interventions and their effects on different work and organisational outcomes, i.e. work engagement, positive emotions and job crafting behaviours. It should be noted, however, that the conclusions we draw from the present research are based on a homogenous sample of Italian employees, which might affect the transcultural validity of our results. Moreover, the size of the sample group was relatively small, which may potentially weaken the statistical solidity of our analyses, decreasing the possibility to generalize the obtained results. Furthermore, given that participation was voluntary, it is likely that engaged and motivated employees may have been more likely to sign up for the study, while burnt out or disengaged ones would be less likely to do so. Unfortunately, we did not collected data referred to our study variables among those who decided to not take part to the intervention, so we are unaware about their levels of work engagement or burnout. Future studies could test the effects of the intervention on the attitudes and behaviours here considered by comparing its effects among participants in different groups, i.e. a control and an intervention group. Data from the present study was derived entirely from self-report questionnaires. Future studies could investigate whether actual behaviour change is likely to result from the intervention by making use of objective and behavioural measures. Finally, this study is quantitative in nature. Even though such a methodological choice offers important insights to understand the relationships between job crafting, positive emotions and work engagement, future studies using qualitative methods could provide the subtleties to further knowledge on the reasons underlying the links found here. Besides the theoretical contribution to research on work-related attitudes and behaviours, our results also suggest specific practical ways in which positive interventions can be used to improve quality of working life. The effects of a positive intervention on work engagement can be a benefit for companies that wish to support the human dimension of organisation sustainability. That is, by providing the employees opportunities to take part in positive interventions aiming to improve personal cognitive resources, organisations can sustain and enhance the development of positive work-related attitudes which are likely to contribute to higher well-being at work, for example in terms of work engagement. Organisations that promote a sustainable work environment and stimulate employees’ development through positive psychology interventions are likely to benefit from a workforce able to adapt the mobilization of its resources to remain competitive or as a means to face fluid job demands. That is, involving employees in interventions focused on improving personal cognitive resources can result in perceptions referred to higher experienced positive emotions, higher enduring positive states referred to work, and to improved awareness about the chances to adjust the characteristics of the work environment. Besides, our study shows the importance of investigating the pattern of an overarching set of work-related attitudes to capture the processes through which interventions influence employees’ quality of working life. Harter JK, Schmidt FL, Hayes TL. Business-unit-level relationship between employee satisfaction, employee engagement, and business outcomes: A meta-analysis. J Appl Psychol 2002; 87(2): 268-79. Ouweneel O, Le Blanc PM, Schaufeli WB. Do-it-yourself: An online positive psychology intervention to promote positive emotions, self-efficacy, and engagement at work. Career Dev Int 2013; 18: 173-95. Luthans F. The need for and meaning of positive organizational behavior. J Organ Behav 2002; 26: 695-706. Bakker AB, Schaufeli WB. Positive organizational behavior: Engaged employees in flourishing organizations. J Organ Behav 2008; 29: 147-54. Sin NL, Lyubomirsky S. Enhancing well-being and alleviating depressive symptoms with positive psychology interventions: A practice-friendly meta-analysis. J Clin Psychol 2009; 65(5): 467-87. Meyers MC, van Woerkom M, Bakker AB. The added value of the positive: A literature review of positive psychology interventions in organizations. Eur J Work Organ Psychol 2013; 22: 618-32. Tims M, Bakker AB. Job crafting: Towards a new model of individual job redesign. SAJIP 2010; 36: 1-9. Wrzesniewski A, Dutton JE. Crafting a job: Revisioning employees as active crafters of their work. Acad Manage Rev 2001; 26: 179-201. Tims M, Bakker AB, Derks D. Development and validation of the job crafting scale. J Vocat Behav 2012; 80: 173-86. Hakanen JJ, Peeters MCW, Schaufeli WB. Different types of employee well-being across time and their relationships with job crafting. J Occup Health Psychol 2018; 23(2): 289-301. Karasek RA, Theorell T. Health work 1990. Bakker AB, Demerouti E. Job demands–resources theory.2014. Hakanen JJ, Bakker AB, Demerouti E. How dentists cope with their job demands and stay engaged: The moderating role of job resources. Eur J Oral Sci 2005; 113(6): 479-87. Hakanen JJ, Perhoniemi R, Toppinen-Tanner S. Positive gain spirals at work: From job resources to work engagement, personal initiative and work-unit innovativeness. J Vocat Behav 2008; 73: 78-91. Bindl U, Parker SK. Feeling good and performing well? Psychological engagement and positive behaviors at work.Handbook of Employee Engagement: Perspectives, Issues, Research and Practice 2011; 385-98. Parker SK, Griffin MA. Understanding active psychological states: Embedding engagement in a wider nomological net and closer attention to performance. Eur J Work Organ Psychol 2011; 20: 60-7. Ouweneel O, Le Blanc PM, Schaufeli WB. Don’t leave your heart at home: Gain cycles of positive emotions, resources, and engagement at work. Career Dev Int 2012; 17: 537-56. Tims M, Derks D, Bakker AB. Job crafting and its relationships with person-job fit and meaningfulness: A three wave study. J Vocat Behav 2016; 92: 44-53. Tims M, Bakker AB, Derks D. Examining job crafting from and interpersonal perspective: Is employee job crafting related to the well-being of colleagues? Appl Psychol 2015; 64(4): 727-53. Seligman ME, Csikszentmihalyi M. Special issue on happiness, excellence, and optimal human functioning: An introduction. Am Psychol 2000; 55: 5-14. Fredrickson BL. The role of positive emotions in positive psychology. The broaden-and-build theory of positive emotions. Am Psychol 2001; 56(3): 218-26. Emmons RA, McCullough ME. Counting blessings versus burdens: An experimental investigation of gratitude and subjective well-being in daily life. J Pers Soc Psychol 2003; 84(2): 377-89. Seligman ME, Steen TA, Park N, Peterson C. Positive psychology progress: Empirical validation of interventions. Am Psychol 2005; 60(5): 410-21. Roberts LM, Dutton JE, Spreitzer GM, Heaphy ED, Quinn RE. Composing the reflected best-self portrait: Building pathways for becoming extraordinary in work organizations. Acad Manage Rev 2005; 30: 712-36. Grant AM. The impact of life coaching on goal attainment, metacognition and mental health. Soc Behav Personal 2003; 31: 253-63. Grant AM, Curtayne L, Burton G. Executive coaching enhances goal attainment, resilience and workplace well-being: A randomised controlled study. J Posit Psychol 2009; 4: 396-407. Luthans F, Youssef CM. Human, social, and now positive psychological capital management: Investing in people for competitive advantage. Organ Dyn 2004; 33: 143-60. Peterson C, Seligman ME. Character strengths and virtues: A handbook and classification 2004. Cooperrider DL, Whitney DD. Appreciative inquiry: A positive revolution in change 2005. Whitney D, Cooperrider DL. The appreciative inquiry summit: Overview and applications. Employ Relat Today 1998; 25: 17-28. Griffeth RW, Hom PW, Gaertner S. A meta-analysis of antecedents and correlates of employee turnover: Update, moderator tests, and research implications for the next millennium. J Manage 2000; 26: 463-88. Fredrickson BL. The value of positive emotions: The emerging science of positive psychology is coming to understand why it’s good to feel good. Am Sci 2003; 91(4): 330-5. Cohn MA, Fredrickson BL. In search of durable positive psychology interventions: Predictors and consequences of long-term positive behavior change. J Posit Psychol 2010; 5(5): 355-66. Fredrickson BL, Cohn MA, Coffey KA, Pek J, Finkel SM. Open hearts build lives: Positive emotions, induced through loving-kindness meditation, build consequential personal resources. J Pers Soc Psychol 2008; 95(5): 1045-62. Seligman MEP, Rashid T, Parks AC. Positive psychotherapy. Am Psychol 2006; 61(8): 774-88. Diener E. Subjective well-being. The science of happiness and a proposal for a national index. Am Psychol 2000; 55(1): 34-43. Bolier L, Haverman M, Westerhof GJ, Riper H, Smit F, Bohlmeijer E. Positive psychology interventions: A meta-analysis of randomized controlled studies. BMC Public Health 2013; 13(1): 119. Keyes CLM. Mental illness and/or mental health? Investigating axioms of the complete state model of health. J Consult Clin Psychol 2005; 73(3): 539-48. Muchinsky PM. Emotions in the workplace: The neglect of organizational behaviour. J Organ Behav 2000; 21: 801-5. Warr P. Work, unemployment, and mental health 1987. Van Katwyk PT, Fox S, Spector PE, Kelloway EK. Using the Job-Related Affective Well-Being Scale (JAWS) to investigate affective responses to work stressors. J Occup Health Psychol 2000; 5(2): 219-30. Gray E, Watson D. Emotion, mood, temperament: Similarities, differences and asynthesis.Emotions at Work: Theory, Research and Applications for Management 2002; 21-44. Schaufeli WB, Salanova M, Gonzalez-Romà V, Bakker AB. The measurement of engagement and burnout: A two sample confirmatory factor analytic approach. J Happiness Stud 2002; 3: 71-92. Cacioppo JT, Gardner WL, Berntson GG. The affect system has parallel and integrative processing components: Form follows function. J Pers Soc Psychol 1999; 76(5): 839-55. Schaufeli WB, van Rhenen W. Over de rol van positieve en negatieve emoties bij het welbevinden van managers: Een studie met de Job-related Affective Well-being Scale (JAWS). Gedrag Organ 2006; 19: 323-44. [About the role of positive and negative emotions in managers’ well-being: A study using the Job-related Affective Well-being Scale (JAWS)]. Fredrickson BL, Branigan C. Positive emotions broaden the scope of attention and thought-action repertoires. Cogn Emotion 2005; 19(3): 313-32. Isen AM. Positive affect and decision making.Handbook of emotions 2nd ed. 2000; 417-35. Demerouti E, Bakker AB, Nachreiner F, Schaufeli WB. The job demands-resources model of burnout. J Appl Psychol 2001; 86(3): 499-512. Cummings TG, Worley CG. Organization Development and Change 2009. Grant AM, Parker SK. Redesigning work design theories: The rise of relational and proactive perspectives. Acad Management Ann 2009; 3: 317-75. Tims M, Bakker AB, Derks D. The impact of job crafting on job demands, job resources, and well-being. J Occup Health Psychol 2013; 18(2): 230-40. Frese M, Fay D. Personal initiative: An active performance concept for work in the 21st century.Research in Organizational Behavior 2001; 133-87. Berg JM, Wrzesniewski A, Dutton JE. Perceiving and responding to challenges in job crafting at different ranks: When proactivity requires adaptivity. J Organ Behav 2010; 31: 158-86. Demerouti E. Design your own job through job crafting. Eur Psychol 2014; 19: 237-47. Deci EL, Ryan RM, Gagné M, Leone DR, Usunov J, Kornazheva BP. Need satisfaction, motivation, and well-being in the work organizations of a former eastern bloc country: A cross-cultural study of self-determination. Pers Soc Psychol Bull 2001; 27: 930-42. Gagné M, Deci EL. Self-determination theory and work motivation. J Organ Behav 2005; 26: 331-62. Moreau E, Mageau GA. The importance of perceived autonomy support for the psychological health and work satisfaction of health professionals: Not only supervisors count, colleagues too! Motiv Emot 2012; 36: 268-86. Nielsen K, Abildgaard JS. The development and validation of a job crafting measure for use with blue-collar workers. Work Stress 2012; 26(4): 365-84. Petrou P, Demerouti E, Peeters MC, Schaufeli WB, Hetland J. Crafting a job on a daily basis: Contextual correlates and the link to work engagement. J Organ Behav 2012; 33: 1120-41. Slemp GS, Vella-Brodrick DA. Optimising employee mental health: The relationship between intrinsic need satisfaction, job crafting, and employee well-being. J Happiness Stud, 201; 15: 957-77. Tims M, Bakker AB. Development and validation of the job crafting scale. J Vocat Behav 2012; 80: 173-86. Costantini A, De Paola F, Ceschi A, Sartori R, Meneghini AM, Di Fabio A. Work engagement and psychological capital in the Italian public administration: A new resource-based intervention programme. SAJIP 2017; 43: 1-11. Podsakoff PM, MacKenzie SB, Lee JY, Podsakoff NP. Common method biases in behavioral research: A critical review of the literature and recommended remedies. J Appl Psychol 2003; 88(5): 879-903. Schaufeli WB, Bakker AB, Salanova M. The measurement of work engagement with a short questionnaire. Educ Psychol Meas 2006; 66: 701-16. Preacher KJ, Hayes AF. Asymptotic and resampling strategies for assessing and comparing indirect effects in multiple mediator models. Behav Res Methods 2008; 40(3): 879-91.